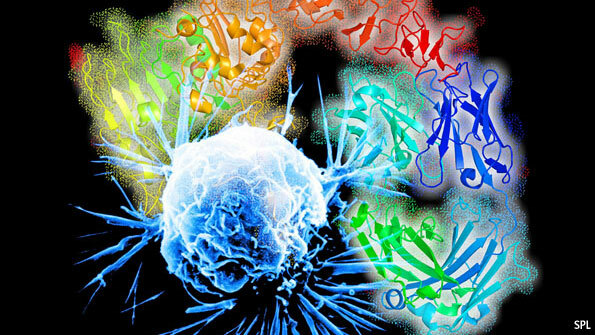 New cancer drugs are technically impressive. But must they cost so much? CANCER is not one disease. It is many. Yet oncologists have long used the same blunt weapons to fight different types of cancer: cut the tumour out, zap it with radiation or blast it with chemotherapy that kills good cells as well as bad ones. These new drugs sell well. Last year Gleevec grossed $4.3 billion. Roche’s Herceptin (the HER2 drug) and Avastin did even better: $6 billion and $7.4 billion respectively. Cancer drugs could rescue big drugmakers from a tricky situation: more than $50 billion-worth of wares will lose patent protection in the next three years. This month Pfizer, an American company, announced that America’s Food and Drug Administration (FDA) would speed up its review of a cancer drug called crizotinib. Roche submitted an FDA application for a new medicine, vemurafenib. The industry is pouring money into clinical trials for cancer drugs (see chart). This is part of a shift in how big drug firms do business. For years they have relied on blockbusters that treat many people. Now they are investing in more personalised medicine: biotech drugs that treat small groups of patients more effectively. Last year the FDA approved Provenge, developed by Dendreon of Seattle to train the immune system to fight prostate cancer. In March the FDA approved Yervoy, Bristol-Myers Squibb’s drug to treat melanoma. And there are promising drugs in the pipeline. Pfizer’s crizotinib attacks a protein encoded by a gene found in fewer than 5% of patients with non-small-cell lung cancer. Roche’s vemurafenib attacks advanced melanoma by blocking the mutated form of a gene, B-RAF. Both Pfizer and Roche are developing tests to help doctors identify suitable patients for their drugs. The snag, from society’s point of view, is that all these drugs are horribly expensive. Last year biotech drugs accounted for 70% of the increase in pharmaceutical costs in America, according to Medco, a drug-plan manager. This trend will continue as drug firms develop new ways to treat, for example, multiple sclerosis and rheumatoid arthritis. Cancer plays a huge role in raising costs. America’s National Institutes of Health predict that spending on all cancer treatment will rise from $125 billion last year to at least $158 billion in 2020. If drugs become pricier, as seems likely, that bill could rise to $207 billion. Britain’s National Institute for Health and Clinical Excellence, a public body that judges whether medicine is cost-effective (ie, what Sarah Palin would call a “death panel”), has rejected several new cancer drugs. That so upset patients and tabloid editors that the British government back-tracked and created a separate fund to pay for expensive oncology drugs. The government now plans to introduce “value-based pricing” by 2014, with a system to price drugs not just for their efficacy but also for their “wider societal benefits”. America does things differently. The government health programme for the elderly is barred from considering price at all when it decides whether to cover injected drugs under something called Medicare Part B. Under Part B’s loopy reimbursement system, the more a drug costs, the more the oncologist who prescribes it is paid. Patients have little reason to demand cheaper drugs. Part B usually covers 80% of a drug’s price, and most patients have additional insurance to cover the remainder. Americans hate to be denied any kind of treatment: a delay in Provenge’s approval prompted furious talk of rationing. America’s propensity to pay has one important benefit: it encourages investment in research. Drugmakers recoup their investments in America; other countries take a free ride. New research may yield better treatments. And today’s cancer drugs may prove more effective when tested in combination with others, predicts Todd Golub, director of the cancer programme at the Broad Institute, a genetics research laboratory. Who will reform this unsustainable system? Private insurers may haggle harder. Patients may grow restive—a recent study found that 10% of cancer patients (not covered by Part B) fail to take prescribed drugs, largely because of the cost. Barack Obama’s reforms are supposed to cajole all health-care providers into becoming more cost-effective, but that will require political bravery to enforce, and few politicians are brave enough to do anything that sounds like rationing grandma’s cancer drugs. Congress recently authorised more than $1 billion to compare the efficacy of drugs—while explicitly ignoring their cost. This entry was posted in CANCER COSTS, CANCER DRUGS, CANCER NEW DRUGS, CANCER PROFITABILITY, Cancer research. Bookmark the permalink.